I was out on a jolly taunt online and found a nasty rumor that someone dethroned your royal highness but I assure you that I am still the King of St Louis. 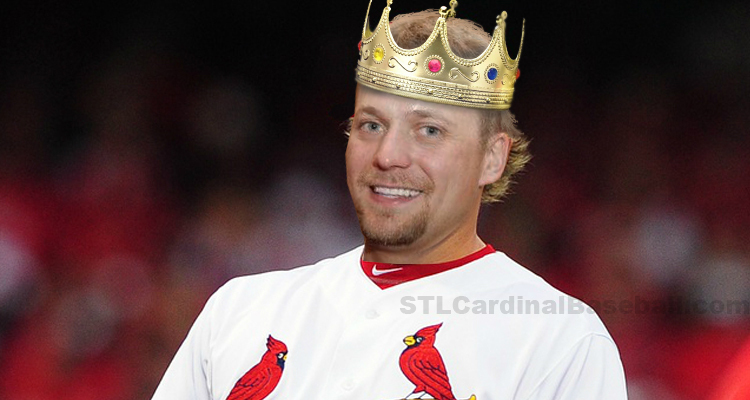 If Trevor Rosenthal was a king he definitely would have one of the best “ARMies” in St Louis. The above picture comes from a year old article by stlcardinalbaseball.com. The article describes how rough the Cardinal closer Trevor Rosenthal’s season was in 2014, the year of our Lord. What the aged periodical would never know is that he would go on to have a huge 2015 season. He tied the saves record for the St Louis Cardinals at 48. To be fair, unlike that mean ol’ article, 2014 was still an impressive season since he finished with 45 saves. I have a feeling with my blessing that in 2016, Rosenthal will have 99 saves (and a loss ain’t one) and can truly still be mistaken as a king. If you wanna watch how royal his arm is check out loads for videos on MLB.com. Congratulations on being insanely talented Mr Trevor Rosenthal.